While each episode features a general overview of the participant’s life story, particularly as it relates to food, we are expanding that narrative by providing the full interview transcript, albeit condensed and lightly edited. It’s their story, in their own words. 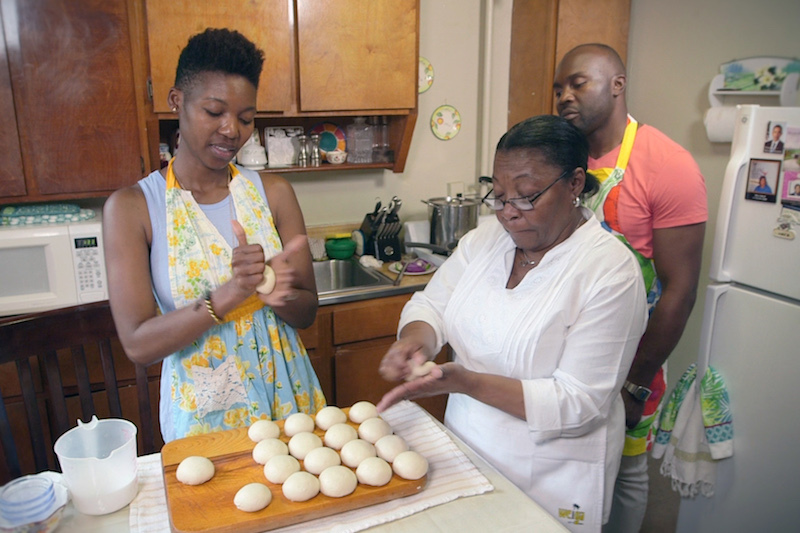 This month we are spotlighting Isha Sumner, a Garifuna immigrant from Honduras who runs a catering business called “Weiga/Let’s Eat” with her mother, Sara Martinez, and has a cookbook of the same name forthcoming. 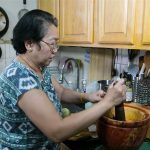 The mother-and-daughter team share their recipe for durudias, tortillas made with coconut milk and brown sugar. 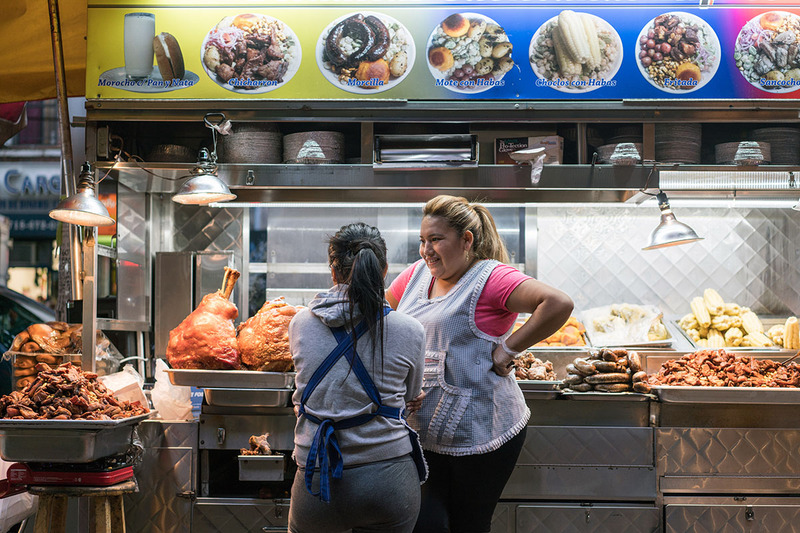 My name is Isha Sumner, I’m from Honduras, and I’ve been living in New York for the past 20 or so years – I’ve been kind of all over the place, Queens, then East Harlem, now West Harlem and Cape Cod. I’m a mom, and I’m married. In Honduras, I remember life being very colorful, being surrounded by a lot of nature, and I remember the ocean, which was my very favorite thing growing up. Back then, we would go fishing, gather wood and yucca, things that were fun but were also work that you had to do to help sustain the family. Life was completely different because in Honduras, you have more of a communal lifestyle: you know everyone in the neighborhood, and everybody knows your name. You take your time doing things. Life happens to you rather than you making life happen. Here in New York, you have to be on the hustle, you have to be on the go. Everything is already set up, and you have to accomplish those things that have been set up before you. For most of the families that come from Honduras, the objective is for the parents to go first to the United States and then their kids can follow, and it’s always looking for a better life, or a better opportunity to live an abundant life. It doesn’t come easily – each and every one of us has to work for that [abundant life]. But once you’re in America, chances are that you will have the opportunity to make that life happen one way or another. I come from a Garifuna family, and I kind of know where I stand as far as my ethnicity and my nationality. And I think it’s very important to know these things, just because the more you know about yourself, the more confident you become about who you are. Ultimately we’re all humans, but knowing your history is very important. For me, being Garifuna means being a survivor, a fighter, someone who is resilient and doesn’t give up easily; it means someone who has dreams and is consistently looking for a home or a place to call home. I would say, loosely speaking, that’s the definition of being Garifuna. Historically speaking, Garifunas are descendants of Arawak Indians and West Africans, people that were exiled from the island of St. Vincent by the English and came to the coast of Honduras and started rebuilding their lives. The origins of the Garifuna language are West African, supposedly from the tribe of Yoruba. And also, there’s a mix of French and some English words, because, you know, we intermingled as well with the French and the English before they turned on us. But the language evolves as it goes to different places, so now that we’re in Honduras, in Belize, in Guatemala, in Nicaragua, you can also hear some Spanish in the language. The kitchen becomes a communal area whenever someone is cooking in the Garifuna culture. I think Garifuna people would agree that we are an adaptable people. We go to a place, we adapt to a certain culture, we make it our own by adding other elements to it. And I think this is case when it comes to food. Take tortillas, which are common in Honduras, made by the Mestizo women. We have adopted tortillas from the Honduran culture to our Garifuna culture, and we have incorporated certain elements like coconut milk [in the tortillas] to make them our own. I love the fact that we get other foods from different cultures. 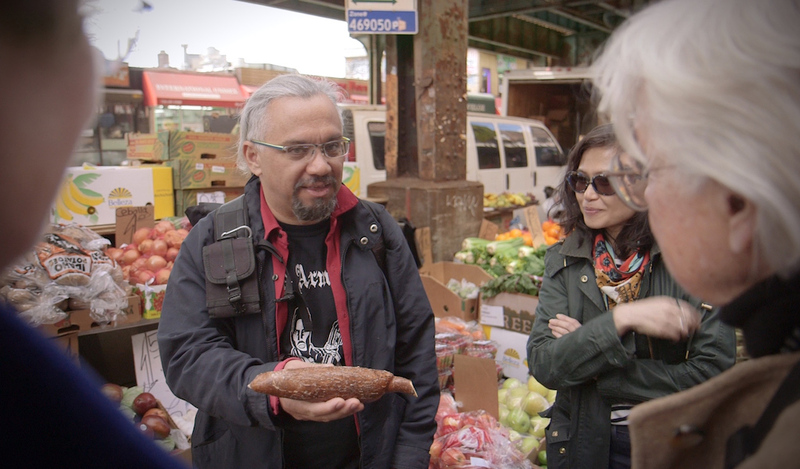 We go to a grocery store, we’ll buy something and it’s not necessarily Garifuna, but we’re going to make some Garifuna food out of it. 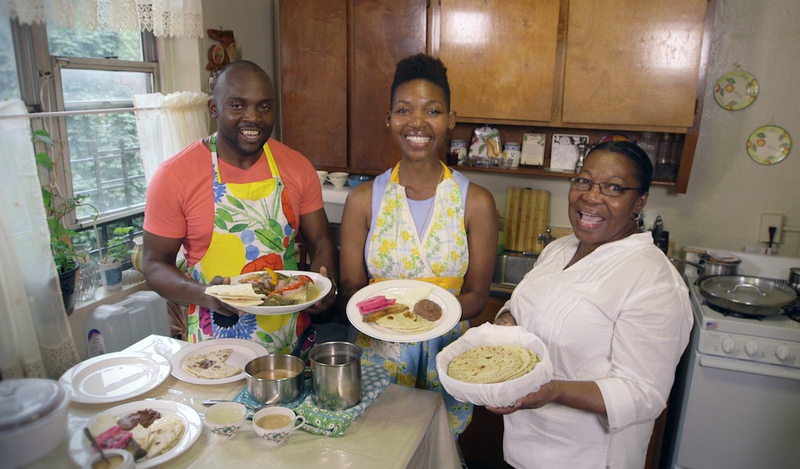 I learned how to cook mostly from my mom, because the kitchen becomes a communal area whenever someone is cooking in the Garifuna culture. Women – it doesn’t matter how old you are – are always welcome into the kitchen and they will find something for you to do. In general, she’ll say, “Oh come on! You can do it!” She has a fun way of approaching it so that she doesn’t make you nervous about learning or wanting to try something new in the kitchen. 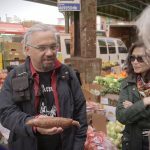 The cookbook came about because of a need to share our food and also a desire to be part of the eclectic food industry in New York City. I was sitting down one day eating with my niece, and we started reminiscing about foods from Honduras and the desserts, and all these things, and I was like, “Wait a minute. Is there a cookbook?” And I went online to check if there was a Garifuna cookbook, and I did find a couple of books but I don’t know, I didn’t identify them as Garifuna. And sometimes there wouldn’t be pictures with the recipes. I love cookbooks and every time I’ve bought a cookbook, it’s because I’ve seen the pictures, and they have given me the necessary step-by-step instructions to make the recipe. It could be from Jerusalem, it could be from Turkey, but if the cookbook is allowing me to cook by showing me pictures and steps, then that cookbook most likely came home with me. So I wanted to create something like that for Garifuna food. My mom is the backbone of the family – she holds everything together. She cooks and then she brings everyone together [around the table]. Nobody ever says, “No, I don’t want any food.” So she utilizes food to keep the family together and bring us under the same roof to have fun, which is something really special because you could easily lose that here in New York. Gatherings are very important because it’s a way of bringing people together and exposing others to the Garifuna culture. Our kids get to learn that we’re the kind of people that like to share and socialize with others, and they can learn about other peoples’ cultures. When we’re sharing with others, I believe that we become better people. 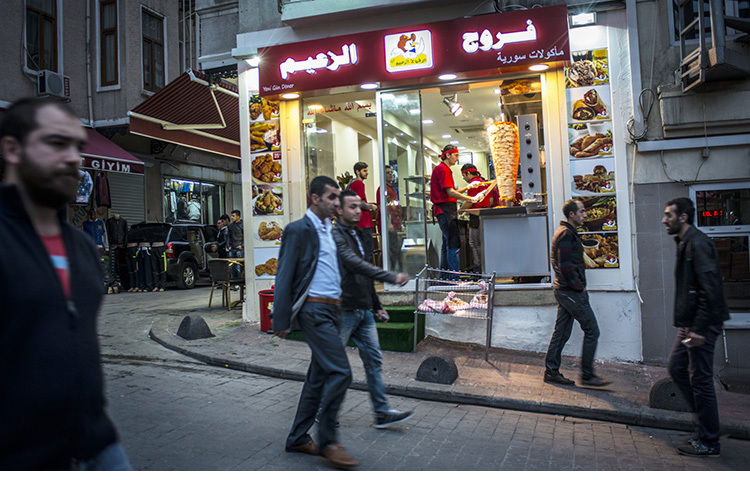 And one way we can explore and enjoy other cultures is through food. 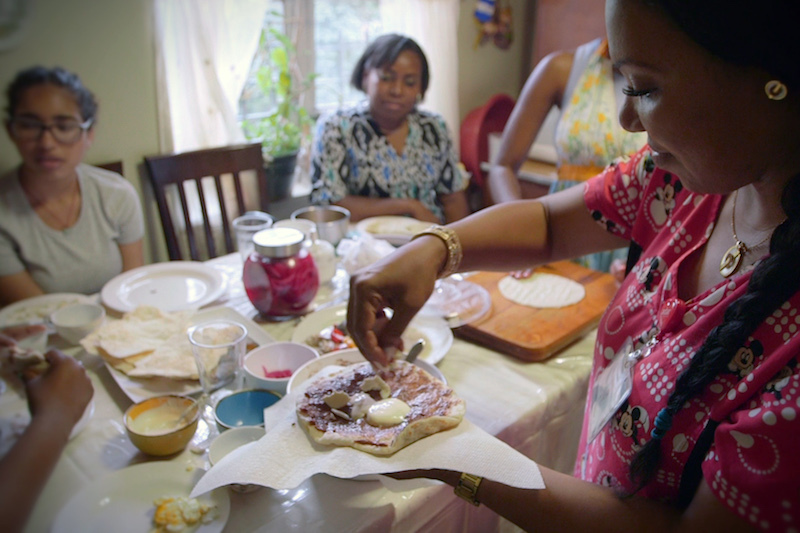 Bringing my friends over to the house and celebrating and gathering is all about exposing them to the Garifuna food culture. We are actually in my mom’s kitchen, in Woodside, Queens. We got together today to enjoy some delicious food and then we’re going to listen to music and then everyone’s going to go home happy. Today we’re having tortillas (which are my favorite), fried fish, steamed fish with coconut milk, fresh beans, refried beans – the food is very reminiscent of either breakfast or dinner in a Garifuna village in Honduras. 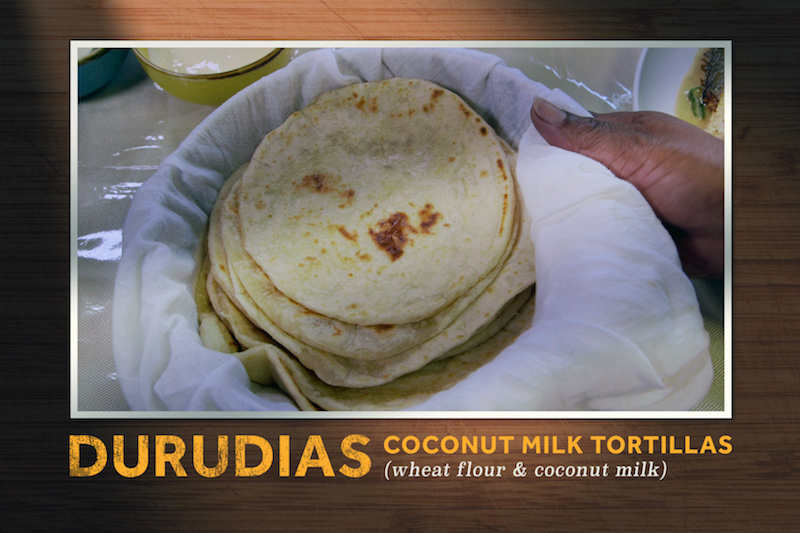 The tortillas are called durudia in the Garifuna language. 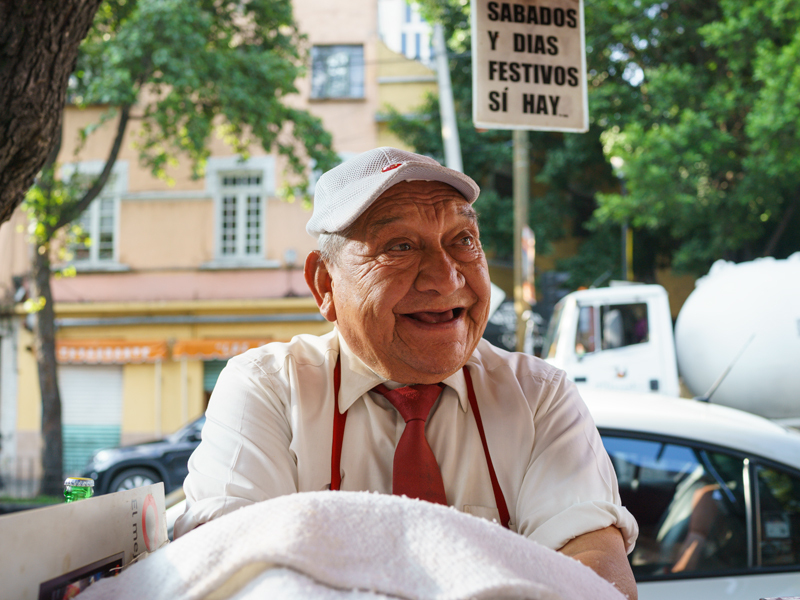 When walking around Honduras, you will see vendors with their stoves on the side of the street selling baleadas, a tortilla with refried beans, cream, cheese and you could add eggs, or you could add chorizo, or you could add chicken, or you could add meat. So this is our version of that dish, because we added fried fish and we added coconut milk to the [tortilla] mix. For the tortilla, we use brown sugar, baking powder, salt and oil. And then, we were able to mix it in the flour and the main ingredient I would say is the coconut milk, because that’s what gives it a different flavor from your regular tortilla. Traditionally the tortillas are done by hand. I know that there are machines out there to help you flatten the tortilla, but there’s also this feeling when you’re making it, like you’re providing and caring [for others]. It’s therapeutic, making this thing. I think the whole machinery part takes that away. I learned the skill of making the little balls in the palm of your hand, kind of rubbing it, pinching it, making a perfect circle with it. It’s learned. You’ve got to practice it. I think it’s important to keep home traditions [like this] alive because they are the only way that we as people, as foreigners, as immigrants can actually feel like we’re back home – as much as we love America, we miss home. And the only way we can get the feel for that is when we gather, it’s when we share food, it’s when we share music. What I want New Yorkers to know about the Garifuna culture is that it’s very vibrant, colorful, welcoming, loving, creative. It’s full of amazing people and amazing food, and I want people to experience that. I want people to say, “Let me give it a chance. I want to try this food.” Because it’s delicious, and I stand by this food.